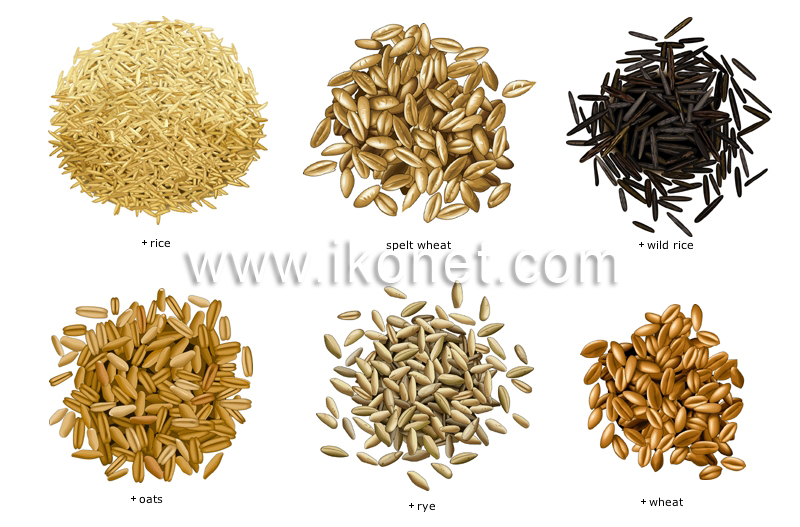 Wheat variety with small brown grains that, once hulled, can be used like rice. Seeds from a North American aquatic plant; it is richer and higher in protein than rice and has a strong nutty flavor. It is sometimes mixed with other kinds of rice. A universal staple, used as a side dish, in sweet and savory dishes such as risotto and paella, and for its by-products (noodles, sake). Often eaten as porridge, it is also an ingredient in date squares, fruit crisp toppings, muffins, cookies and pancakes. Yields a flour that can be combined with wheat flour to make bread; it is also used in brewing (beer) and distilling (whisky). Cereal cultivated for its grain, of great significance in human food production; it is used to produce foodstuffs such as flour, bread and semolina.